She was best known for her sharp tongue, quirky sense of humor and undying loyalty. She journeyed on peacefully in the privacy of her own home in her sleep. She was 85. Throughout her life she was a devoted wife and mother of six beautiful children and cared for her grandchildren as her own. She was a hard worker who loved to read and traveled the world once her children were of age. Viola was the epitome of strength and instilled this same quality in those she loved. She will be missed dearly. She is survived by her daughters Vicky, Valarie, Charlene, and her beloved grandchildren Tiffany, Derek, Vert, Breon, Lennon, Tashawnda, William, Tierra, Tamara, Greg and Darlene. To send flowers or a remembrance gift to the family of Viola Posey, please visit our Tribute Store. 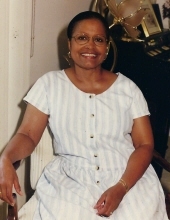 "Email Address" would like to share the life celebration of Viola Posey. Click on the "link" to go to share a favorite memory or leave a condolence message for the family.